GALION — Jerry Pangborn has been named to head the City of Galion’s Line Department. The City of Galion announced Pangborn’s hiring as Electrical Distribution Superintendent on Thursday. He started June 4, and has an annual salary of $72,000. As superintendent, Pangborn will oversee a crew of four linemen and two groundmen. The Line Department maintains the electrical distribution system for nearly 6,000 customers, including outage response and new service connection. Pangborn previously worked in the Line Department from 1999 until 2004. But most recently, he spent 12 years working with Carter Electric. 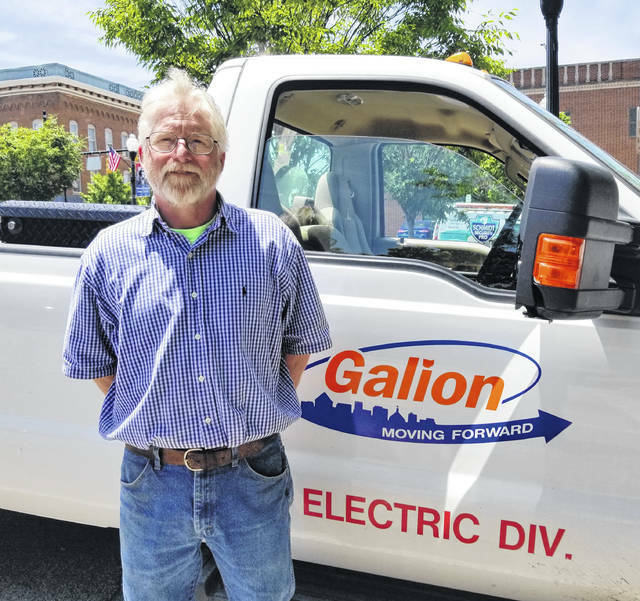 “I ran my own business and crews most of my life, and since I had worked here before I figured it would be a good fit,” Pangborn said about his decision to come back to work for the City of Galion. One of priorities, he said, is to finish converting street lighting to energy-efficient LED bulbs. In his spare time, he enjoys hunting, fishing, and boating. Courtesy photo Jerry Pangborn has been named superintendent of the city of Galion’s Line Department. https://www.galioninquirer.com/wp-content/uploads/sites/38/2018/06/web1_Jerry-Pangborn.jpgCourtesy photo Jerry Pangborn has been named superintendent of the city of Galion’s Line Department.